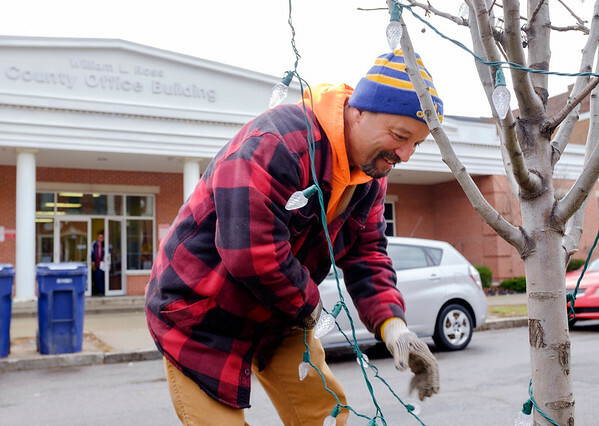 Joed Viera/Staff Photgrapher-City worker Scott Cercone removes holiday decorations from the trees on Main Street's medians on January, 4, 2016 in Lockport, N.Y. For residents wondering what to do with their Christmas trees: In the Town trees are considered one of residents six bags of refuse. In the City trees are considered separate from normal garbage and are picked up by the city chipper which goes out year round and loosely follows the garbage route. It is recommended to not wrap the trees and to place the trunks out towards the curb.